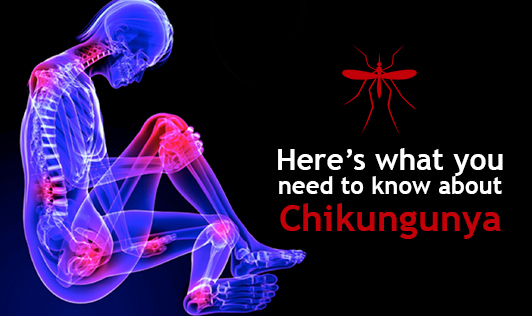 Chikungunya is a mosquito-borne disease that is usually on the rise during monsoon season. And, although it is quite common, not everyone knows about the disease, preventive measures, and treatment options that can be followed. Here are a few pointers that can help improve your understanding of the disease and give a clear picture about the condition. Chikungunya is a viral disease that transmits through infected mosquitoes breeding in stagnant water during the rainy season. The condition is also often misdiagnosed as dengue as they share similar symptoms. However, one major distinguishing symptom of the disease is severe joint pain which can be agonizing but vary in severity. The disease generally affects the hand, wrist, and ankle joints. Other symptoms include sudden onset of fever, fatigue, muscle pain, headache, nausea, and rash. There is no cure for the disease and only the symptoms of the condition are usually treated. The virus can cause acute (short-term), sub-acute (intermediate), or chronic (long term) disease. Therefore the symptoms can last for a few days or even extend over a few weeks. Diagnosis is done by testing for ‘anti-chikungunya’ antibodies by performing a simple blood test. Treatment, as mentioned earlier, is not specifically targeted towards the disease itself but focuses on relieving symptoms. There is no vaccine available for Chikungunya at the moment. Being away from any stagnant water bodies (natural or artificial) that could be potential mosquito-breeding grounds. Covering water tanks and containers in order to prevent mosquito breeding. Draining and cleaning flower vases and pot trays regularly. Using insecticides to eliminate any mosquitoes present in the vicinity. Repellents can be used on the skin and clothing to keep mosquitoes away when outdoors and when staying indoors, mosquito coils, vaporizers, and nets can also be utilized. Wearing long sleeved clothing can help prevent mosquito bites. Natural essential oils like citronella, lemongrass, tea tree, and clove can be used as vaporizers to keep mosquitoes away. For kids, mosquito repellent bands which are coated with these natural oils are available in the market. Prevention is better than cure! If you suspect or are diagnosed with Chikungunya, it’s best to stay at home, get ample rest, and not self-medicate.